I was surprised how easy it was to have a wood burning stove fitted. The hardest part was making the decision about which stove to buy, oh and convincing my husband to have a stove instead of an open fire. This is the first major change we’ve done to our house and I hope the rest of the changes will be as easy and successful, particularly with the children who have been fascinated with the stove since it was installed. A real fire was on our new house wish list, obviously it wasn’t the top priorities but we knew it would make any house more appealing to us. We were so excited about moving into a house with a fireplace that we almost bought a grate the first weekend, but other things got in the way. Once the warmer weather arrived we focussed on other things, although I bought ED a wood store for his birthday in Spring so he could start collecting any wood he found. Neither Ed nor I have experience with wood burning stoves, but liked the higher efficiency compared to open fires. However we wanted the impression of having an open fire in the room so knew we would get a stove with a large window. I also insisted on a simple style because I really dislike objects with fancy mouldings as they tend to be difficult to clean (I spent ages cleaning the skirting board in our old house as the previous owners had not wiped up spilt drinks). We chose the second store, Fireplace Magic near Reading, because we felt more confident having met the installer and were happy to give him a key to our house, and they did a great job. This is the change. We started with an early 1990s fireplace which had never been used but had chunks out of the hearth where we assume it was hit by wheelchairs. We now have a stove with a granite base. You can tell from the plaster and the bare floor where the carpet no longer fits that we’re not quite finished yet, although this is probably how it will look for a year (or two), until we decorate the whole room and know whether we want a surround. We will not start decorating until we’ve changed the layout upstairs to remove the ensuite waste pipes in one corner and moved the door to the hall; which means removing the lift. Once that door is in place we hope the heat will spread around the house more. We will also be making plans to improve the insulation so we retain more the of heat. Currently, the loft insulation is patchy, although an improvement on when we moved in, when parts of the loft had no insulation laid because it was all in large piles. The double glazing is old, not very efficient and in some windows the seals have broken, plus for some reason we have a few windows and doors that are single glazed. We also have no insulation in the floor, just carpet glued to concrete, not comfortable or warm when playing with the children on my knees. I know it is important to improve the efficiency of the house, but I’ve also been looking at alternative ways to generate heat and I’m very interested in ground source heat pumps. As we will be changing most of the house it makes sense, to me, to install anything like underfloor heating now. I have to admit since the colder weather has arrived that we are all loving the stove, and not the children. How efficient is your house? Do you have any recommendations? Linking up to What’s the story and Magic Moments for the first time, to capture the excitement of our new wood burning stove which I hope will be in place for so long the children forget it didn’t come with the house and to explain why the slightly fuzzing picture is special. No disclaimer required. I’ve mentioned the company who installed our stove because I was very pleased with their service. This is the first time I’ve edited pictures on my tablet. My process is not perfect (why did they suddenly save as jpg instead of png) but I hope this will make it easier for me to post in future. That looks so lovely. I can see why you had it on your wishlist, and love the photo of the kids staring at it! Oh it is so lovely knowing we can get the lounge all snug and cosy. Now to make the rest of the house look as good. Alex, thank you for the comment. I think you can have them fitted without a chimney. I’ve seen them where it appears they’ve knocked through the wall and put a flue on the outside of the house, it looks like a silver tube. It might be worth asking some fitters. 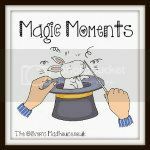 so lovely to have you linked up with #MagicMoments! Looks great. Definitely on my wish list.